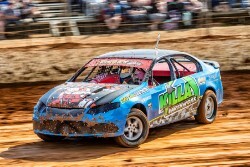 Craig Williams has won his second Feature Race of the season when he took out the Des Redburn Memorial at the Cranes Combines Carrick Speedway on Saturday night. It would be Williams second feature win at the venue for the season, as the seven times State Champion led all twenty laps of the A Main. After the qualifying heats, Williams would start along side Joshua Marston in the A Main, with Jakobe Jetson and Luke Williams starting on the second row. The race would ultimately go without incident and run flag to flag, with Marston retiring two laps from the finish, elevating Jetson and Trent Quillerat to the podium positions after the pair had been third and fourth respectively for the majority of the race.